Texas Instruments emerged in 1951 after a reorganization of Geophysical Service Incorporated, a company founded in 1930 that manufactured equipment for use in the seismic industry, as well as defense electronics. TI produced the world's first commercial silicon transistor in 1954, and designed and manufactured the first transistor radio in 1954. Jack Kilby invented the integrated circuit in 1958 while working at TI's Central Research Labs. TI also invented the hand-held calculator in 1967, and introduced the first single-chip microcontroller (MCU) in 1970, which combined all the elements of computing onto one piece of silicon. 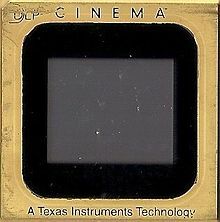 In 1987, TI invented the digital light processing device (also known as the DLP chip), which serves as the foundation for the company's award-winning DLP technology and DLP Cinema. In 1990, TI came out with the popular TI-81 calculator which made them a leader in the graphing calculator industry. In 1997, its defense business was sold to Raytheon, which allowed TI to strengthen its focus on digital solutions. After the acquisition of National Semiconductor in 2011, the company had a combined portfolio of nearly 45,000 analog products and customer design tools, making it the world's largest maker of analog technology components. Texas Instruments was founded by Cecil H. Green, J. Erik Jonsson, Eugene McDermott, and Patrick E. Haggerty in 1951. McDermott was one of the original founders of Geophysical Service Inc. (GSI) in 1930. McDermott, Green, and Jonsson were GSI employees who purchased the company in 1941. In November, 1945, Patrick Haggerty was hired as general manager of the Laboratory and Manufacturing (L&M) division, which focused on electronic equipment. By 1951, the L&M division, with its defense contracts, was growing faster than GSI's Geophysical division. The company was reorganized and initially renamed General Instruments Inc. Because there already existed a firm named General Instrument, the company was renamed Texas Instruments that same year. From 1956 to 1961, Fred Agnich of Dallas, later a Republican member of the Texas House of Representatives, was the Texas Instruments president. Geophysical Service, Inc. became a subsidiary of Texas Instruments. Early in 1988 most of GSI was sold to the Halliburton Company. Texas Instruments exists to create, make and market useful products and services to satisfy the needs of its customers throughout the world. In 1930, J. Clarence Karcher and Eugene McDermott founded Geophysical Service, an early provider of seismic exploration services to the petroleum industry. In 1939, the company reorganized as Coronado Corp., an oil company with Geophysical Service Inc (GSI), now as a subsidiary. On December 6, 1941, McDermott along with three other GSI employees, J. Erik Jonsson, Cecil H. Green, and H.B. Peacock purchased GSI. During World War II, GSI expanded their services to include electronics for the U.S. Army, Signal Corps, and the U.S. Navy. In 1951, the company changed its name to Texas Instruments, with GSI becoming a wholly owned subsidiary of the new company. An early success story for TI-GSI came in 1965 when GSI was able (under a Top Secret government contract) to monitor the Soviet Union's underground nuclear weapons testing under the ocean in Vela Uniform, a subset of Project Vela, to verify compliance of the Partial Nuclear Test Ban Treaty. Texas Instruments also continued to manufacture equipment for use in the seismic industry, and GSI continued to provide seismic services. After selling (and repurchasing) GSI, TI finally sold the company to Halliburton in 1988, at which point GSI ceased to exist as a separate entity. In early 1952, Texas Instruments purchased a patent license to produce germanium transistors from Western Electric Co., the manufacturing arm of AT&T, for $25,000, beginning production by the end of the year. On January 1, 1953, Haggerty brought Gordon Teal to the company as a research director. Gordon brought with him his expertise in growing semiconductor crystals. Teal's first assignment was to organize what became TI's Central Research Laboratories (CRL), which Teal based on his prior experience at Bell Labs. Among his new hires was Willis Adcock who joined TI early in 1953. Adcock, who like Teal was a physical chemist, began leading a small research group focused on the task of fabricating "grown-junction silicon single-crystal small-signal transistors. Adcock later became the first TI Principal Fellow. In January 1954 Morris Tanenbaum at Bell Labs created the first workable silicon transistor. This work was reported in the spring of 1954, at the IRE off-the-record conference on Solid State Devices, and was later published in the Journal of Applied Physics. Working independently in April 1954, Gordon Teal at TI created the first commercial silicon transistor and tested it on April 14, 1954. On May 10, 1954, at the Institute of Radio Engineers (IRE) National Conference on Airborne Electronics in Dayton, OH,Teal presented a paper: "Some Recent Developments in Silicon and Germanium Materials and Devices,". In 1954, Texas Instruments designed and manufactured the first transistor radio. The Regency TR-1 used germanium transistors, as silicon transistors were much more expensive at the time. This was an effort by Haggerty to increase market demand for transistors. Jack Kilby, an employee at TI's Central Research Labs, invented the integrated circuit in 1958. Kilby recorded his initial ideas concerning the integrated circuit in July 1958, and successfully demonstrated the world's first working integrated circuit on September 12, 1958. Six months later, Robert Noyce of Fairchild Semiconductor (who went on to co-found Intel) independently developed the integrated circuit with integrated interconnect, and is also considered an inventor of the integrated circuit. In 1969, Kilby was awarded the National Medal of Science, and in 1982 he was inducted into the National Inventor's Hall of Fame. Kilby also won the 2000 Nobel Prize in Physics for his part of the invention of the integrated circuit. Noyce's chip, made at Fairchild, was made of silicon, while Kilby's chip was made of germanium. In 2008, TI named its new development laboratory "Kilby Labs" after Jack Kilby. In 2011, Intel, Samsung, LG, ST-Ericsson, Huawei's HiSilicon Technologies subsidiary, Via Telecom and three other undisclosed chipmakers licensed the C2C link specification developed by Arteris Inc. and Texas Instruments. 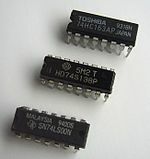 The 7400 series of transistor-transistor logic (TTL) chips, developed by Texas Instruments in the 1960s, popularized the use of integrated circuits in computer logic. The military grade version of this was the 5400 series. Texas Instruments invented the hand-held calculator (a prototype called "Cal Tech") in 1967 and the single-chip microcomputer in 1971, was assigned the first patent on a single-chip microprocessor (invented by Gary Boone) on September 4, 1973. This was disputed by Gilbert Hyatt, formerly of the Micro Computer Company, in August 1990 when he was awarded a patent superseding TI's. This was over-turned on June 19, 1996 in favor of TI (note: Intel is usually given credit with Texas Instruments for the almost-simultaneous invention of the microprocessor). In 1978, Texas Instruments introduced the first single-chip LPC speech synthesizer. In 1976 TI began a feasibility study of memory intensive applications for bubble memory then being developed. They soon focused on speech applications. This resulted in the development the TMC0280 one-chip linear predictive coding (LPC) speech synthesizer which was the first time a single silicon chip had electronically replicated the human voice. This was used in several TI commercial products beginning with Speak & Spell which was introduced at the Summer Consumer Electronics Show in June 1978. In 2001 TI left the speech synthesis business, selling it to Sensory Inc. of Santa Clara, California. In May 1954, Texas Instruments designed and built a prototype of the world's first transistor radio, and, through a partnership with Industrial Development Engineering Associates (I.D.E.A.) of Indianapolis, Indiana, the 100% solid-state radio was sold to the public beginning in October of that year. In 1973, the handheld calculator SR-10 (named after slide rule) and in 1974 the handheld scientific calculator SR-50 were issued by TI. Both had red LED-segments-numeric displays. The optical design of the SR-50 is somewhat similar to the HP-35 edited by Hewlett Packard before in early 1972, but buttons for the operations "+", "–", ... are in the right of the number block and the decimal point lies between two neighbouring digits. TI continued to be active in the consumer electronics market through the 1970s and 1980s. Early on, this also included two digital clock models; one for desk, and the other a bedside alarm. From this sprang what became the Time Products Division, which made LED watches. Though these LED watches enjoyed early commercial success thanks to excellent quality, it was short lived due to poor battery life. LEDs were replaced with LCD watches for a short time, but these could not compete because of styling issues, excessive makes and models, and price points. The watches were manufactured in Dallas and then Lubbock, Texas. In 1978, Texas Instruments introduced the first single-chip speech synthesizer, and incorporated it in a product called Speak & Spell. Several spin-offs, such as the Speak & Read and Speak & Math, were introduced soon thereafter. In 1979, TI entered the home computer market with the TI-99/4, a competitor to such entries as the Apple II, Tandy/Radio Shack TRS-80 and the later Atari 400/800 series and Commodore VIC-20. It discontinued the TI-99/4A (1981), the sequel to the 99/4, in late 1983 amidst an intense price war waged primarily against Commodore. At the 1983 Winter CES, TI showed models 99/2 and the Compact Computer 40 (CC-40), the latter aimed at professional users. The TI Professional (1983) ultimately joined the ranks of the many unsuccessful DOS and x86-based—but non-compatible—competitors to the IBM PC (the founders of Compaq, an early leader in PC compatibles, all came from TI). The company for years successfully made and sold PC-compatible laptops before withdrawing from the market and selling its product line to Acer in 1998. Texas Instruments entered the defense electronics market in 1942 with submarine detection equipment, based on the seismic exploration technology previously developed for the oil industry. The division responsible for these products was known at different points in time as the Laboratory & Manufacturing Division, the Apparatus Division, the Equipment Group and the Defense Systems & Electronics Group (DSEG). During the early 1980s, Texas Instruments instituted a quality program which included Juran training, as well as promoting statistical process control, Taguchi methods and Design for Six Sigma. In the late '80s, the company, along with Eastman Kodak and Allied Signal, began involvement with Motorola institutionalizing Motorola's Six Sigma methodology. Motorola, who originally developed the Six Sigma methodology, began this work in 1982. In 1992, the DSEG division of Texas Instruments' quality improvement efforts were rewarded by winning the Malcolm Baldrige National Quality Award for manufacturing. TI developed the AAA-4 infra-red search and track (IRST) in the late 50's and early 60's for the F-4B Phantom for passive scanning of jet engine emissions but possessed limited capabilities and was eliminated on F-4D's and later models. In 1956, TI began research on infrared technology that led to several line scanner contracts and with the addition of a second scan mirror the invention of the first forward looking infrared (FLIR) in 1963 with production beginning in 1966. In 1972 TI invented the Common Module FLIR concept, greatly reducing cost and allowing reuse of common components. TI went on to produce side-looking radar systems, the first terrain following radar and surveillance radar systems for both the military and FAA. TI demonstrated the first solid-state radar called Molecular Electronics for Radar Applications (MERA). In 1976 TI developed a microwave landing system prototype. In 1984 TI developed the first inverse synthetic aperture radar (ISAR). The first single-chip gallium arsenide radar module was developed. In 1991 the Military Microwave Integrated Circuit (MIMIC) program was initiated – a joint effort with Raytheon. In 1961, TI won the guidance and control system contract for the defense suppression AGM-45 Shrike anti-radiation missile. This led later to the prime on the High-speed Anti-Radiation Missile (AGM-88 HARM) development contract in 1974 and production in 1981. In 1964, TI began development of the first laser guidance system for precision-guided munitions (PGM) leading to the Paveway series of laser-guided bombs (LGBs). The first LGB was the BOLT-117. In 1969, TI won the Harpoon (missile) Seeker contract. In 1986 TI won the Army FGM-148 Javelin fire-and-forget man portable anti-tank guided missile in a joint venture with Martin Marietta. In 1991 TI was awarded the contract for the AGM-154 Joint Standoff Weapon (JSOW). Because of TI's research and development of military temperature range silicon transistors and integrated circuits (ICs), TI won contracts for the first IC-based computer for the U.S. Air Force in 1961 (Molecular Electronic Computer) and for ICs for the Minuteman Missile the following year. In 1968, TI developed the data systems for Mariner Program. In 1991 TI won the F-22 Radar and Computer development contract. As the defense industry consolidated, TI sold its defense business to Raytheon in 1997 for $2.95 billion. The Department of Justice required that Raytheon divest the TI Monolithic Microwave Integrated Circuit (MMIC) operations after closing the transaction. The TI MMIC business accounted for less than $40 million in 1996 revenues, or roughly two percent of the $1.8 billion in total TI defense revenues was sold to TriQuint Semiconductor, Inc. Raytheon retained its own existing MMIC capabilities and has the right to license TI's MMIC technology for use in future product applications from TriQuint. 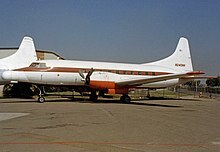 Shortly after Raytheon acquired TI DSEG, Raytheon then acquired Hughes Aircraft from General Motors. Raytheon then owned TI's mercury cadmium telluride detector business and Infrared (IR) systems group. In California, it also had Hughes infrared detector and an IR systems business. When again the US government forced Raytheon to divest itself of a duplicate capability, the company kept the TI IR systems business and the Hughes detector business. As a result of these acquisitions these former arch rivals of TI systems and Hughes detectors work together. Immediately after acquisition, DSEG was known as Raytheon TI Systems (RTIS). It is now fully integrated into Raytheon and this designation no longer exists. Texas Instruments was active in the 1980s, in the area of artificial intelligence. In addition to ongoing developments in speech and signal processing and recognition, it developed and sold the Explorer computer family of Lisp machines. For the Explorer a special 32-bit Lisp microprocessor was developed, which was used in the Explorer II and the TI MicroExplorer (a Lisp Machine on a NuBus board for the Apple Macintosh). AI application software developed by TI for the Explorer included the Gate Assignment system for United Airlines, described as "an artificial intelligence program that captures the combined experience and knowledge of a half-dozen United operations experts." In software for the PC, they introduced "Personal Consultant" a rule-based expert system development tool and runtime engine, followed by "Personal Consultant Plus" written in the Lisp-like language from MIT known as Scheme, and the natural language menu system NLMenu. Texas Instruments was a major OEM of sensor, control, protection, and RFID products for the automotive, appliance, aircraft, and other industries. The S&C division was headquartered in Attleboro, Massachusetts. In 2006, Bain Capital LLC, a private equity firm, purchased the Sensors & Controls division for $3.0 billion in cash. The RFID portion of the division remained part of TI, transferring to the Application Specific Products business unit of the Semiconductor division, with the newly formed independent company based in Attleboro taking the name Sensata Technologies. In 1997, TI sold its software division, along with its main products such as the CA Gen, to Sterling Software, which is now part of Computer Associates. However, TI still owns small pieces of software, such as the software for calculators like TI Interactive!. TI also creates a significant amount of target software for its digital signal processors, along with host-based tools for creating DSP applications. In 2000, a team at TI had a desire to sell Code Composer Studio software to customers via the internet. In response, an employee bought an off-the-shelf program and built an eCommerce platform over the course of one weekend – the result was TI store. During the same year, a separate online integrated circuit (IC) sample ordering system was launched to replace a physical room where orders were received via phone, fax, and email and then fulfilled by hand. In 2002, the TI store inventory was expanded to include paid evaluation modules (EVMs) and a separate home-grown online evaluation module sample system was launched. This resulted in 3 separate eCommerce systems for TI: one for paid evaluation modules, one for sample evaluation modules, and one for sample integrated circuits. In 2010, the TI store was completely redesigned using a new online platform. Additionally, sample evaluation modules were moved into the eStore from the home-grown application. In 2014, at the TI store: integrated circuit samples were moved into the store from the home-grown application and integrated circuit purchase options were added. These changes combined all evaluation and development modules, integrated circuits, and sample programs into one platform. In 2015, the TI store increased its maximum order quantity from 99 to 999. In December 2016, Code Composer Studio v7 was released at no cost, as it included a new licensing model: Technology Software Publicly Available (TSPA). On August 6, 1999, Texas Instruments Inc. announced the restatement of its results for parts of 1998 and the first quarter of 1999 after a review by the Securities and Exchange Commission over the timing of charges for a plant closing and writedown. For the fiscal year 2017, Texas Instruments reported earnings of US$3.682 billion, with an annual revenue of US$14.961 billion, an increase of 11.9% over the previous fiscal cycle. Texas Instruments shares traded at over $82 per share, and its market capitalization was valued at over US$88.0 billion in October 2018. As of 2018, Texas Instruments ranked 192nd on the Fortune 500 list of the largest United States corporations by revenue. Today, TI is made up of four divisions: analog products, embedded processors (EP), digital light processing (DLP), and educational technology (ET). Analog products connect the physical and the digital worlds – turning signals like sound, pressure, temperature, humidity and light into digital 1s and 0s to be used by electronic devices – and translating that data back to information we interact with in the real world. These chips, including data converters, power management and other devices, can extend and optimize battery life, improve accuracy, sense conditions like humidity and temperature and much more. Texas Instrument's analog integrated circuit portfolio includes both power management and signal chain devices, as well as integrated analog device and application solutions. Embedded processors are the processing brains of electronics that gather inputs from analog chips and perform computational processing to operate a system. Embedded processors can be low power and enable long battery life or energy efficient products, or they can be high performance to allow complex analytics systems or systems with high computational throughput and everything in between. Also included are wireless connectivity products that enable connectivity and help to bring life to the Internet of Things. Texas Instruments Embedded Portfolio Overview is made up of three sub-divisions: Wireless, Microcontrollers, and Processors. MSP432: low cost, low power consumption + performance, 32-bit ARM Cortex-M4F CPU for use in embedded applications, now rebranded as part of the SimpleLink platform. In the past, TI has also sold microcontrollers based on ARM7 (TMS470) and 8051 cores. In addition to its microcontrollers, Texas Instruments also produces several multi-core processor lines. TI develops specific products that cater to a broad range of Digital Signal Processing applications, such as digital still cameras, cable modems, Voice over IP (VOIP), streaming media, speech compression and recognition, wireless LAN and gateway products (residential and central office), and RFID. TI’s remaining businesses consisting of DLP products (primarily used in projectors to create high-definition images), calculators and certain custom semiconductors known as application-specific integrated circuits (ASICs). These businesses, along with royalties, accounted for $1.9 billion of revenue in 2015. Digital Light Processing (DLP) is a trademark under which Texas Instruments sells technology regarding TVs, video projectors and digital cinema. 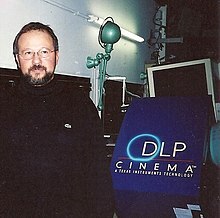 On February 2, 2000, Philippe Binant, technical manager of Digital Cinema Project at Gaumont in France, realized the first digital cinema projection in Europe with the DLP CINEMA technology developed by TI. DLP technology enables a diverse range of display and advanced light control applications spanning industrial, enterprise, automotive and consumer market segments. The ASICs business develops more complex integrated circuit solutions for clients on a custom basis. Texas Instruments produces a range of calculators, with the TI-30 being one of the most popular early calculators. TI has also developed a line of graphing calculators, the first being the TI-81, and most popular being the TI-83 Plus (with the TI-84 Plus being an updated equivalent). There are many TI calculators still selling without graphing capabilities. The TI-30 has been replaced by the TI-30X IIS. There are some financial calculators for sale on the TI website. In 2007, TI released the TI-Nspire family of calculators, as well as computer software that has similar capabilities to the calculators. In the 1990s, with the advent of TI's graphing calculator series, programming became popular among some students. The TI-8x series of calculators (beginning with the TI-81) came with a built-in BASIC interpreter, through which simple programs could be created. The TI-85 was the first TI calculator to allow assembly programming (via a shell called "ZShell"), and the TI-83 was the first in the series to receive native assembly. While the earlier BASIC programs were relatively simple applications or small games, the modern assembly-based programs rival what one might find on a Game Boy or PDA. Around the same time that these programs were first being written, personal web pages were becoming popular (through services such as Angelfire and GeoCities), and programmers began creating websites to host their work, along with tutorials and other calculator-relevant information. This led to the formation of TI calculator webrings and eventually a few large communities, including the now-defunct TI-Files and still-active ticalc.org. The TI community reached the height of its popularity in the early 2000s, with new websites and programming groups being started almost daily. In fact, the aforementioned community sites were exploding with activity, with close to 100 programs being uploaded daily by users of the sites. There was also a competition between both sites to be the top site in the community, which helped increase interest and activity in the community. One of the common unifying forces that has united the community over the years has been the rather contentious relationship with Texas Instruments regarding control over its graphing calculators. TI graphing calculators generally fall into two distinct groups: those powered by the Zilog Z80 and those running on the Motorola 68000 series. Both lines of calculators are locked by TI with checks in the hardware and through the signing of software to disable use of custom flash applications and operating systems. However, users employed the general number field sieve to find the keys and publish them in 2009. TI responded by sending invalid DMCA takedown notices, causing the Texas Instruments signing key controversy. Enthusiasts had already been creating their own operating systems before the finding of the keys, which could be installed with other methods. TI has the largest market share in the analog semiconductor industry which has an estimated market TAM exceeding US$37 billion. In 1996, TI acquired Tartan, Inc. In 1997, TI acquired Amati Communications for $395 million. In 1998, TI acquired GO DSP. In 1998, TI acquired the standard logic (semiconductor) product lines from Harris Semiconductor, which included the CD4000, HC4xxx, HCT, FCT, and ACT product families. In 1999, TI acquired Libit Signal Processing Ltd. of Herzlia, Israel for approximately $365 million in cash. In 1999, TI acquired Butterfly VLSI, Ltd. for approximately $50 million. In 1999, TI acquired Telogy Networks for $457 million. In 1999, TI acquired Unitrode Corporation (NYSE:UTR). In 2000, TI acquired Burr-Brown Corporation for $7.6 billion. In 2006, TI acquired Chipcon for approximately $200 million. In 2009, TI acquired CICLON and Luminary Micro. In 2011, TI acquired National Semiconductor for $6.5 billion. 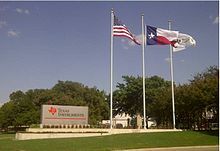 On April 4, 2011, Texas Instruments announced that it had agreed to buy National Semiconductor for $6.5 billion in cash. Texas Instruments would pay $25 per share of National Semiconductor stock. It was an 80% premium over the share price of $14.07 as of April 4, 2011 close. The deal made Texas Instruments the world's largest maker of analog technology components. The companies formally merged on September 23, 2011. ^ "Investor FAQs". Texas Instruments. Archived from the original on January 27, 2007. Retrieved January 29, 2007. ^ "Rich Templeton to reassume President and CEO roles in addition to his current role as Chairman; Brian Crutcher resigned as CEO". PR Newswire. Retrieved July 17, 2018. ^ a b c d e f "Texas Instruments - Annual Report". Retrieved July 13, 2018. ^ "TI Mailing Address Archived February 19, 2009, at the Wayback Machine." Texas Instruments. Retrieved on June 12, 2009. ^ "Top semiconductor companies sales 2012-2015 | Statistic". Statista. Archived from the original on July 5, 2016. Retrieved July 8, 2016. ^ a b "About TI – Technology and innovation – TI.com". www.ti.com. Archived from the original on July 12, 2016. Retrieved July 8, 2016. ^ "TI Fact sheet | Who we are | Company | About TI". www.ti.com. Archived from the original on July 19, 2016. Retrieved August 1, 2016. ^ "Texas Instruments - Low Bandwidth Timeline - Key TI Events". www.ti.com. Archived from the original on June 29, 2016. Retrieved July 8, 2016. ^ a b "About TI – History – TI.com". www.ti.com. Archived from the original on July 10, 2016. Retrieved July 8, 2016. ^ "TI IR - CI - AD - Raytheon Purchases Defense Systems and Electronics Business". www.ti.com. Archived from the original on August 15, 2016. Retrieved July 8, 2016. ^ "Texas Instruments Closes $6.5B Acquisition Of National Semiconductor". Archived from the original on September 24, 2011. Retrieved September 23, 2011. ^ "About TI – History". www.ti.com. Archived from the original on June 29, 2016. ^ Haggerty, Patrick (1981). "The Corporation and Innovation". Strategic Management Journal. 2 (2): 97–118. doi:10.1002/smj.4250020202. ^ "GSI/TI part of Vela Uniform project to detect underground nuclear explosions". Texas Instruments. Archived from the original on March 3, 2016. Retrieved September 23, 2016. ^ A tribute to Erik Jonsson Archived November 9, 2006, at the Wayback Machine. (PDF) . Retrieved on April 19, 2012. ^ Spectrum Archived April 9, 2008, at the Wayback Machine. Spectrum.ieee.org. Retrieved on April 19, 2012. ^ The Chip that Jack Built Archived May 1, 2015, at the Wayback Machine, (c. 2008), (HTML), Texas Instruments, accessed May 29, 2008. ^ Robert Noyce Archived December 20, 2008, at the Wayback Machine, (n.d.), (online), IEEE Global History Network, accessed July 8, 2008. ^ "Texas Instruments - Low Bandwidth Timeline - Key TI Events". www.ti.com. Archived from the original on August 3, 2016. Retrieved July 25, 2016. ^ Rick Merritt, EE Times. "Ten mobile vendors license chip interconnect Archived September 30, 2011, at the Wayback Machine." July 26, 2011. Retrieved July 27, 2011. ^ "The Rise of TTL: How Fairchild Won a Battle But Lost the War | Computer History Museum". www.computerhistory.org. Archived from the original on July 21, 2016. Retrieved July 26, 2016. ^ "Texas Instruments Speech – Integrated Circuits". Datamath Calculator Museum. Archived from the original on May 10, 2008. Retrieved September 7, 2008. ^ TI web site history page Archived June 9, 2007, at the Wayback Machine,(c. 2008), (HTML), Texas Instruments, accessed September 6, 2008. ^ EE Times. " "Archived copy". Archived from the original on February 17, 2012. Retrieved February 6, 2016. CS1 maint: Archived copy as title (link)." June 14, 2001. ^ "Texas Instruments - 1954 Regency Radio debuts". www.ti.com. Archived from the original on August 15, 2016. Retrieved July 26, 2016. 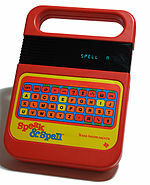 ^ "Texas Instruments - 1978 Speak & Spell introduced". www.ti.com. Archived from the original on July 14, 2016. Retrieved July 26, 2016. ^ Sizing up the Professional. PC Magazine. March 6, 1984. pp. 242–245. ISSN 0888-8507. ^ "TI IR - CI - AD - Acer Acquires Texas Instruments Mobile Computing Assets". www.ti.com. Archived from the original on March 23, 2016. Retrieved July 26, 2016. ^ Sweetman 1987, p. 526. ^ Sweetman 1987, p. 552. ^ "Molecular Electronic Computer brochure | 102646283 | Computer History Museum". www.computerhistory.org. Archived from the original on March 14, 2018. Retrieved March 13, 2018. ^ "Raytheon announces Justice Department approval of Texas Instruments acquisition". Business Wire. July 2, 1997. Archived from the original on July 10, 2012. ^ "Raytheon Company Announces Sale of MMIC Operations Acquired from Texas Instruments". Business Wire. January 9, 1998. Archived from the original on July 7, 2012. ^ Raytheon TI Systems – important information Archived November 9, 2006, at the Wayback Machine. Ti.com. Retrieved on April 19, 2012. ^ "Texas Instruments". www.ti.com.cn. Archived from the original on August 17, 2016. Retrieved July 26, 2016. ^ "Bain Capital to Purchase Sensors & Controls Business of Texas Instruments for $3 Billion" (Press release). Texas Instruments. January 9, 2006. Archived from the original on January 11, 2006. ^ "Sensata Technologies, Inc. - Press Room - History of Our Company". investors.sensata.com. Archived from the original on June 2, 2014. Retrieved July 26, 2016. ^ "TI InterActive!™ - Features Summary Texas Instruments - Eastern Europe". education.ti.com. Archived from the original on August 15, 2016. Retrieved July 26, 2016. ^ "DSP | Tools & Software | Processors | TI.com". www.ti.com. Archived from the original on July 21, 2016. Retrieved July 26, 2016. ^ "Download CCS - Texas Instruments Wiki". processors.wiki.ti.com. Archived from the original on April 1, 2014. ^ "Texas Instruments Restates Statements After SEC Review". Archived from the original on September 6, 2013. ^ a b c "About TI – Technology and innovation – TI.com". www.ti.com. Archived from the original on July 12, 2016. Retrieved July 25, 2016. ^ a b c d e "Analog Signal Chain and Power Management Products | TI.com". www.ti.com. Archived from the original on July 24, 2016. Retrieved July 25, 2016. ^ "Embedded Processors | TI.com". www.ti.com. Archived from the original on July 29, 2016. Retrieved July 25, 2016. ^ "Texas Instruments MCU products 101 page Archived July 4, 2010, at the Wayback Machine." Texas Instruments. Retrieved on May 21, 2010. ^ "SimpleLink Wired MCUs > SimpleLink MSP432 Microcontrollers"
^ Education.ti.com Archived August 2, 2002, at the Wayback Machine. Education.ti.com. Retrieved on April 19, 2012. ^ Ticalc.org Archived June 11, 2006, at the Wayback Machine. Ticalc.org. Retrieved on April 19, 2012. ^ Ticalc.org Archived June 4, 2011, at the Wayback Machine. Ticalc.org. Retrieved on April 19, 2012. ^ "Acquisitions and divestitures". 1996. ^ "TI to Acquire Amati Communications for $395 Million" (Press release). Texas Instruments. November 19, 1997. Retrieved November 17, 2018. ^ "Texas Instruments Inc acquires GO DSP Corp". Archived from the original on February 20, 2012. Retrieved August 26, 2018. ^ "TI to buy Harris' logic portfolio". EDN. November 6, 1998. Retrieved February 3, 2019. ^ "TI to purchase FCT logic business from Cypress". EDN. December 1, 1999. Retrieved February 3, 2019. ^ Dorsch, Jeff (June 28, 1999). "TI to Acquire Libit Signal of Israel for $365M". Electronic News. Archived from the original on July 10, 2012. ^ "TI to Acquire Butterfly VLSI, Ltd". 1999. Archived from the original on October 8, 2012. ^ Dorsch, Jeff (1999). "TI to Acquire Telogy for $457M". Electronic News. Archived from the original on July 17, 2012. 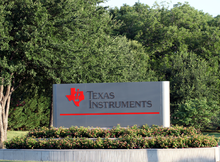 ^ "Texas Instruments to Acquires Unitrode". Archived from the original on July 3, 2013. ^ "Texas Instruments to Acquire Burr-Brown". Archived from the original on February 20, 2012. ^ "TI to Acquire Chipcon". Archived from the original on January 16, 2013. ^ "TI Acquires Luminary Micro" (Press release). Luminary Micro. May 14, 2009. Archived from the original on July 14, 2011. Retrieved April 6, 2011. ^ "Texas Instruments buys Luminary Micro". Austin Business Journal. American City Business Journals. May 15, 2009. OCLC 40561857. Archived from the original on October 26, 2012. Retrieved April 6, 2011. ^ Ken Sweet (April 4, 2011). "Texas Instruments to buy National Semiconductor for $6.5 billion". CNN. Archived from the original on April 7, 2011. ^ "TI to acquire National Semiconductor: Complementary portfolios are foundation for growth" (PDF) (Press release). National Semiconductor. April 4, 2011. Archived from the original (PDF) on April 9, 2011. Retrieved April 6, 2011. ^ "TI to Acquire National Semiconductor". ti.com. Texas Instruments Incorporated. Archived from the original on April 7, 2011. Retrieved April 6, 2011. ^ Jordan Robertson (April 4, 2011). "Texas Instruments buying National Semiconductor". Yahoo! Finance. Associated Press. Archived from the original on April 7, 2011. Retrieved April 6, 2011. ^ "Texas Instruments completes acquisition of National Semiconductor". Texas Instruments. Archived from the original on October 1, 2011. Retrieved October 12, 2011. Sweetman, Bill and Bonds, Ray. The Great Book of Modern Warplanes. New York, New York: Crown Publishers, 1987. ISBN 0-517-63367-1. Wikimedia Commons has media related to Texas Instruments.